Additional info The product is NOT encrypted and can be used on multiple domains. Depending on the product edition you might be allowed to install the product only on certain maximum number of domains. Some of our products are packaged with encrypted source code. This means that you cannot see or edit the source code. In order to use an encrypted product you will need to have the free ionCube loader installed on your web server. A very flexible and easy-to-use pattern model is used for defining page titles. The assembling of a title is defined with a pattern. A pattern defines the part of which the title is assembled and their order. Allows you to set default title starting/ending part that is active for all pages(patterns). It is possible to mark a pattern as “strict”. Strict patterns are only used if all of their items could be resolved. Normal patterns just skip items that could not be resolved for the current page. This helps you making context-dependant patterns. Allows you to use breadcrumbs items in titles. For more information on breadcrumbs items and the Breadcrumbs Manager extension, click here. 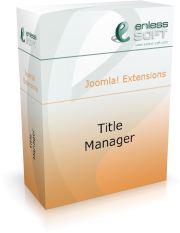 This extension features standard Joomla-style administrative interface. This extension is designed with extensibility in mind. It features simple plug-in architecture to allow user customization. More details on creating extensions is available in the product documentation. Provides the ability to define titles based on contexts. For more information on contexts and the Advanced Contexts Manager extension, click here. This extension does not change any of the Joomla core files. This means that you can update your Joomla installation without worrying that something may break.